Using a durable rubber net like band that wraps around your phone, our armband can support any device with a screen size of 4 to 6inches. This covers every smartphone on the market today. 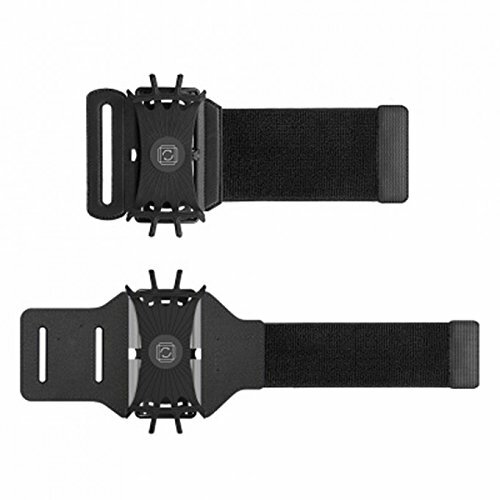 With a dual length adjustement system, this armband has the ability to fit the smallest to the largest arms. Just simply weave the strap through the closest hole to fit smaller, and weave through the hole on the outside of the band to adjust for a larger arm. Keep an eye on your time, watch your heart rate or even send a message using our rotatable mount. This allows you to turn your device towards you while on the go. Stay connected to your device while on the go. Access all of your phones buttons and features with our armband design. Since the rubber band is adjustable around your phone, it doesnt cover what you need to access. 【COMPLETE UNIVERSAL FIT】- Introducing our all new armband designed to fit EVERY SIZE OF ARM. Using powerful velcro to wrap around your arm comfortably, you can be assured the armband stays snugly in place during vigorous activities. To keep your phone in place, we use a new type of strong stretchy rubber that is specially designed to stretch and fit your phone screen no matter it's size. These bands can be stretched to hold PLUS SIZED & REGULAR SIZED phones in place. 【 USE THIS ARMBAND FOR EVERYTHING 】 - If you enjoy WORKING OUT, HIKING, CYCLING, JOGGING, WEIGHT LIFTING GYM TRAINING, OR ANY OTHER SPORTS, then this Armband is perfect for you. Unisex design makes it great for all women, men, teens, boys and girls to use this armband. This stunning Armband is much different from others you will see on Amazon by offering exceptional quality and comfort all at the same time of giving you the best looking Armband in the gym. 【 BRING COMFORT TO YOUR EXERCISING 】- As seen on FOX, CBS, NBC and ABC Featuring the all new LIGHTWEIGHT and BREATHABLE flexible arm strap that hugs your arm and assures the Armband will stay in place during your run or work out. Our all new design has vents to keep air flow between your arm and phone. Our SOFT but durable fabric will allow you customize your Armband to fit your arm PERFECTLY! In just a few seconds you will have this Armband Holster adjusted to fit your arm comfortably! If you have any questions about this product by Kaidelin, contact us by completing and submitting the form below. If you are looking for a specif part number, please include it with your message. Quality (Black) LG Thrill 4G Smart Phone Armband with Sweat Resistant lining for LG Thrill 4G Android Phone (AT&T) + Live * Laugh * Love Vangoddy Wrist Band!! !